The 1992 Olympic Games are probably best remembered for one of the most spectacular and stylish opening ceremonies of all time . 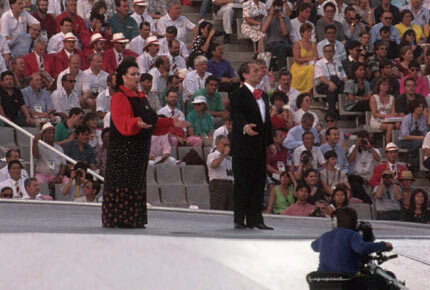 Held in the neo-classical Olympic Stadium on Montjuic, there were performances by the Spanish Opera stars, Placido Domingo, Jose Carreras, and Montserrat Caballe. Other highlights included the mythical birth of Barcelona from the sea, followed by ocean battles between sea monsters & humans. The fanfares and symphonic works of Santos from opening and closing ceremonies of Barcelona 1992 can be found on his special Olympic CD - Música Para Las Ceremonias Olímpicas Barcelona 92. Welcome - "Benvinguts" or "welcome" in Catalan, composed by Joan Lluís Moraleda and Lluís Serrahima and performed by Josep Carreras and Montserrat Caballe. Land of Passion - "Yermita" by Francisco Arriaga, Sevillan music by Gualberto García. "Te Quiero, Morena" by Placido Domingo, the traditional flamenco piece "Sevillana" and "Del Cabello Mas Sutil" by Alfredo Kraus. Extracts of the theme of "Boccherini (La ritirata)" were used for the sounds of the drums from Aragón. Entre Dos Mundos by Placido Domingo contains the song 'Te Quiero Morena'. Ryuichi Sakamoto's work can be found on his CD, Cinemage - released in 1997. A percussive medley based on themes and variations of traditional Spanish pieces. Composed and arranged by Carlos Miranda. "España" composed by Carlos Miranda greets the Spanish team. "Hellenism", composed by Mikis Theodorakis and performed by Greek mezzo-soprano Agnes Baltsa. The song is based of Greek poet Iannis Ritsos, who was imprisoned and deported on several occasions for his opposition to the dictatorial regimes in power in his native country and is an arranged version of "Tha Semanoun oi Kampanes" (The Bells Will Ring). The raising of the flag was to "Olympic Hymn", performed by tenor, Alfredo Kraus. The XXV Olympiad - "XXVth Anniversary Theme" composed by Angelo Badalamenti. "The Flaming Arrow" and "Olympic Torch Theme" composed by Angelo Badalamenti. "Friends for Life", written by Sir Andrew Lloyd Webber and performed by the opening ceremony choir. Human Pyramids - Music of the popular Catalan instrument, "Gralles". "Barcelona Games Medley". 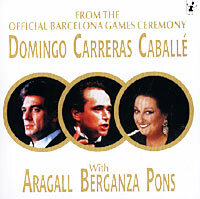 Conducted by Garcia Navarro with the City of Barcelona Symphony Orchestra and Montserrat Caballé (soprano), Teresa Berganza (mezzosoprano), Joan Pons (baritone) and tenors, Giacomo Aragall, José Carreras, Plácido Domingo. The Barcelona Games Medley for the prelude to the finale of the opening ceremony can be found on the CD Barcelona. "Symphony No. 9", the "Ode to Joy" composed by Ludwig Van Beethoven - the official anthem of the European Union. Performed by Eleazor Colomer with Montserrat Caballé (soprano), Teresa Berganza (mezzosoprano), Joan Pons (baritone) and tenors, Giacomo Aragall, José Carreras, Plácido Domingo. A Very Special Race - A fanfare by Josep María Bardagí. Concierto de Aranjuez, composed by Joaquín Rodrigo and performed by guitarist Feliu Gasull with the City of Barcelona Symphony Orchestra. Conducted by Josep Pons. "Cancion del Fuego Fatuo" composed by Manuel de Falla and performed by Teresa Berganza (mezzo-soprano). "Symphony No. 9", the "Ode to Joy" composed by Ludwig Van Beethoven - the official anthem of the European Union. "España" composed by Carles Santos. The Olympic fanfare by Carles Santos. Amigos Para Siempre, written by Sir Andrew Lloyd Webber and performed by Sarah Brightman and Josep Carreras. "Cobi's Farewell", composed by Carles Santos. The slogan for the games, Amics per sempre (Forever friends), inspired the well-known song of the same name heard throughout the Games and subsequently in a recording by the tenor Josep Carreras. The latter was also the musical director for the opening and closing ceremonies, which included performances by a large number of prestigious names from the world of the performing arts: the theatre groups La Fura del Baus and the Comediants; great opera singers of the likes of Montserrat Caballé, Plácido Domingo, Jaume Aragall, Victòria dels Àngels, Josep Carreras himself and the late Alfredo Kraus. And let’s not forget the splendid collaboration between the late Freddie Mercury, lead singer of the British pop group Queen, and Montserrat Caballé in the recording of Barcelona to promote the ’92 Olympics.